LX Lower Radiator Baffle Mod. In February of 2006, my Magnum was used as the prototype car for an intake manufacturer who was looking to enter the big-block V8 market. Up to this point they had concentrated on smaller 4-cylinder, JDM sports cars. This was to be their first foray into big block American muscle. Unfortunately their specialty in smaller engines eventually translated into an inability to handle the capacity that the current-generation hemi motor requires: Their filters were not large enough and the motor starved a bit; losing horsepower. However, one thing came out of that full day of work that, unbeknownst to anyone at that time, would be among the most widely-used grassroots modifications to the LX platform. Something that had profound implications to all intake products of any style that came to market after that day. 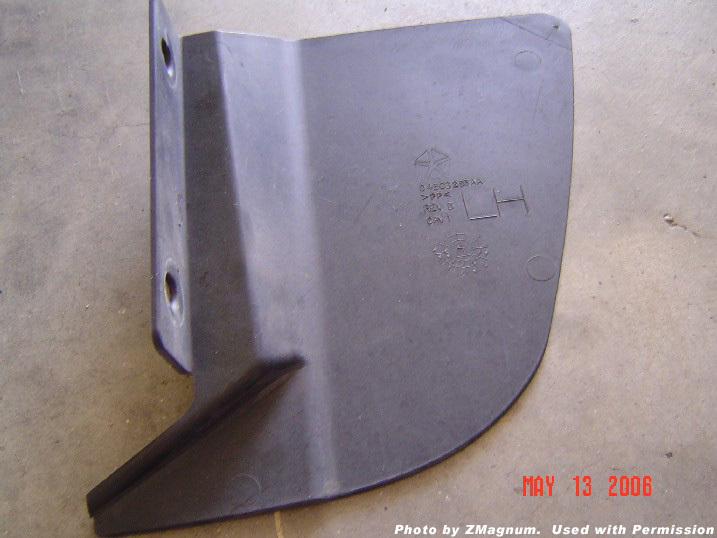 Once popularized, some intake manufacturers came to specify this modification as a requirement to properly use their product. It came about when, at the beginning of the day manufacturer's engineer asked me "If you could have the perfect intake, what would you want? We'll build it." Part of what I asked for was a scoop to bring air into the engine compartment. With the car up on the rack and the belly pan off, the way to best route that scoop was found. 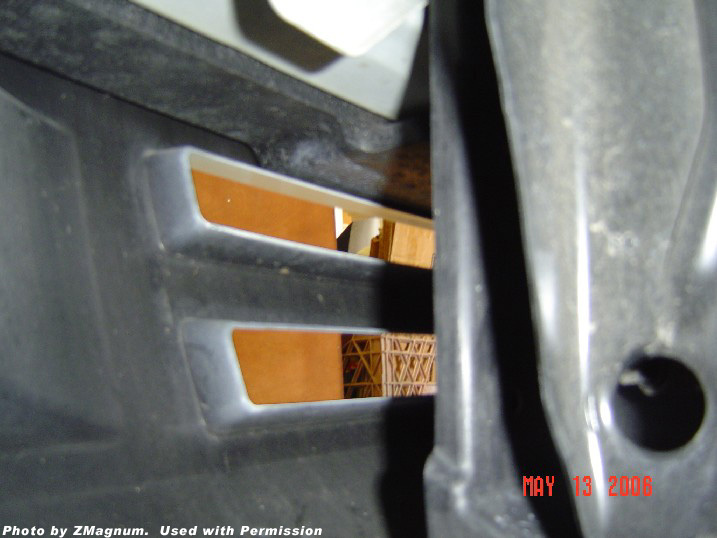 The radiators on these cars have two baffles on each side of the radiator, which guide air into the radiator and in fact create a higher-pressure area that helps force air through it. The front end of an LX car is actually sealed from incoming outside air. The only way for air to get inside in any quantity is for it to go in through the radiator. This makes perfect sense from the standpoint of engine cooling. Of the four baffles, the upper baffles are fairly large, spanning most of the height of the radiator. However the lower baffles are quite small, and near the bottom side. In fact, they line right up with the lower grille. By happy coincidence the lower baffles do not directly face open air, but rather are right next to the open grille... and right on the edge of the high-pressure area created by the grille depression and inward-sloping baffles. The result: Open this baffle up and mass quantities of ambient air comes rushing into the engine compartment. Even better, the inrushing air is directly underneath the location of the intake air filter for both the stock airbox and any aftermarket intake. Intake air temperatures just got a great big kick down towards the optimum, which is ambient air unheated by the engine compartment. 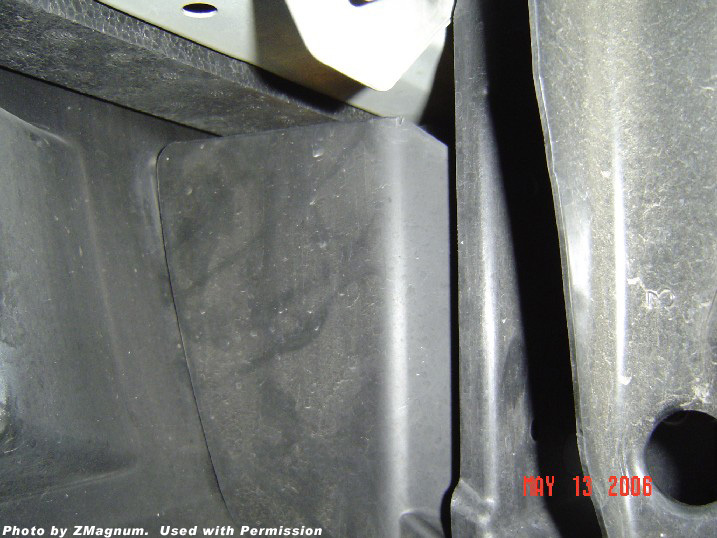 While some have removed both lower baffles, or even all of them, best results for intake air cooling are achieved simply by removing only the drivers side lower baffle. 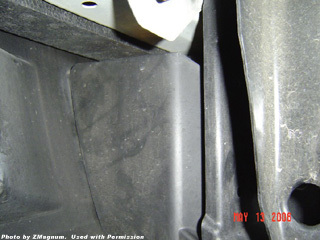 Removal of the passenger side lower baffle has been reported to do no harm, but has also not been demonstrated to do any good. Removing all of the baffles, both lower and upper, has been shown to raise engine water temperatures, and this makes sense given their purpose, and the fact that the motor is water-cooled and not air-cooled. Whatever happened to that scoop? It was built but never installed. Just making this hole worked so well there was no need to go any further.